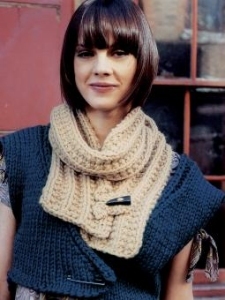 : This cute chunky scarf features a textured rib pattern and a button to create a cowl-like effect. This design is free from the Rowan website. Remember to download or print the pattern by following the link provided on this page, as it will not be shipped with the yarn. You'll also need to sign up for a free account on the Rowan website to be able to access their free patterns. Size US 15 straight needles and 1 toggle button are required but not included. Gauge: 10 sts and 12 rows over 4". Color shown is #048 Linen. Brittany Birch Single Point - US 15 - 10"